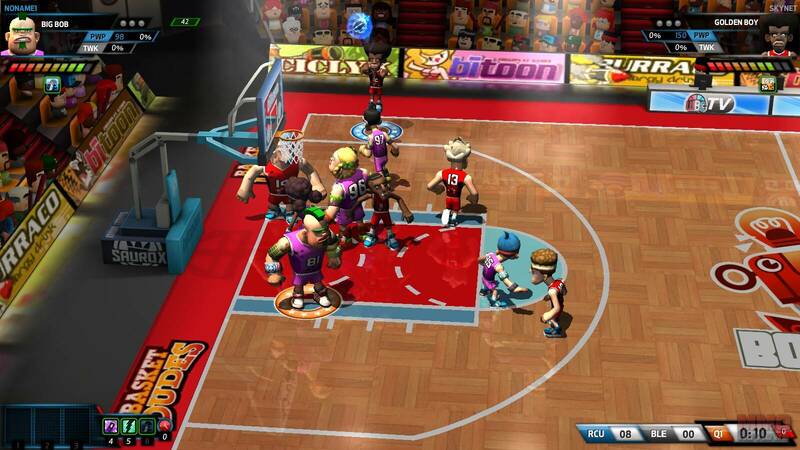 BasketDudes is a free to play 3-D basketball MMO with an arcade style gameplay that mixes some RPG features with elements of Trading Card Games. In the game you are the coach of a World Basketball Club (WBC), and your objective is to lead your own team and play against the challenging game AIor against other players in action packed PVP matches. ATrain your own players, each with its own history, gaming style and attributes, and use this information to create a cohesive team whose skills complement each other. Gain XP as a manager and unlock new features and players. In the game your first task as a manager is to create a team, by choosing between several initial premade teams of five players with different play styles. Once you have chosen one of the initial teams, you have to design its equipment, create their logo and choose a name. To create your team's logo, you have at your disposal a wide variety of images, fonts and colors. Finally before accepting all your choices you are able to look over your team in all their glory, complete with uniform and logo before confirming your selection. During games coaches can control his players, and move them by the Court using the keyboard and perform various actions such as make passes, fake shots, throwing to basket, normal shots, hooks, taunts, charges, defenses and more. The more actions the player performs and the longer that they stay on the court without being substituted the more fatigued they will suffer, which directly lowers the individual players performance. During matches, coaches can use cards, talents and traits to enhance the skills of their team, either offering a continuous buff or an instantaneous effect that is triggered and command. Game Cards can only be used once, talents can be used several times in a game (but have a cool down time on them and are assigned to a specific player) and the traits, more powerful versions of talents which work passively to further enhance your particular player. The managers will get cards at the end of each match, whose rarity will depend on how well have the team played. These cards can be used to improve the performance of your team during a match, or outside of the matches to train up players, improving their abilities or even customising your team in various ways. Cards can be used to customize your uniforms, players (with new hairstyles or for example removing tattoos), obtain new basketballs and more. For those players that struggle to earn cards through playing they are able to purchase them from the in game store. In BasketDudes there are two divisions: in the WBC: the Beginners Division an the WBC All-Stars Division. Beginners Division: This division is made up from new teams and is divided in three leagues: the rookie league, level 1 to 7, amateur league, levels 8 to 11 and pro league, levels 12 to 14. WBC All-Stars Division: Any team that reaches level 15 will automatically enters the WBC all-stars division where they will be able to compete against other managers and working towards reaching a top rank. Players are matched against each other with their All Star Points (ASP) ranking, similar to an ELO ranking, with a win and lose points depending on how they play and their are a variety of sub leagues within this division dividing up the best players. Every day the best team of the beginners division is rewarded with a trophy, and every 15 days the best team of the WBC All-Stars Division will receive an exclusive trophy . Looking for more Free MMO Browser-based games,Free MMO sport games,Free MMORPGs,Free MMOs games?